Would you go swimming in lawn chemicals, pet waste, or cooking grease? Of course not. So don’t EVER put these things down stormwater drains. Water entering storm drains, unlike water entering sanitary sewers, does not get treated before entering Biscayne Bay, the Intracoastal Waterway, the Atlantic Ocean, and our canals, rivers and lakes. Therefore, it is important we are mindful of all things that enter our storm drains, as they will inevitably end up in our canals, bays and ocean. Rain water makes everything fresh and clean including our streets. And after a heavy rain, stormwater in our streets rushes into storm drains. These storm drains are important in providing a place for stormwater to go and help prevent our streets from flooding. But it isn’t only rain water that rushes into storm drains. Say “pollution” and many people think of a factory pipe spewing pollutants. The federal Clean Water Act and similar state laws limit this type of pollution. Today, we know that even neighborhoods without factories add pollutants to our water. How? 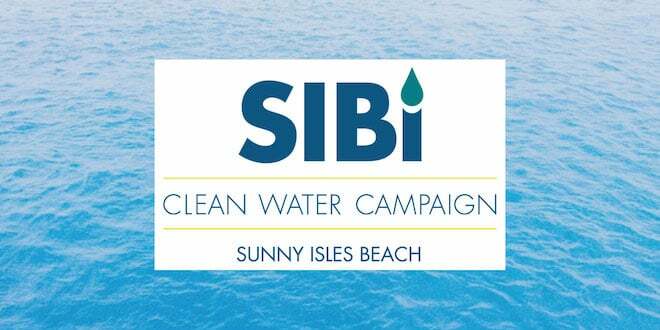 In urban areas, like Sunny Isles Beach, stormwater carries with it everything from our modern, urban lives, including cigarette butts, litter, lawn chemicals, pet waste, grease and motor oil. Everything that goes into storm drains impacts our oceans, canals and lakes. Polluted stormwater draining into our waterways is harmful to plants and animals. Litter: cans, paper and plastic bags and cigarette butts. Chemicals: detergents, automotive fluids and fertilizers. Organic waste: leaves, lawn and garden clippings and animal excrement. Litter injures unsuspecting fish, turtles, and even manatees and whales. Harsh chemicals (like automotive and cleaning fluids) are toxic to marine life. Large doses of organic pollution cause fish and other marine life to suffocate from lack of dissolved oxygen (consumed in the process of decomposition). Individually and collectively just by disposing of items properly, we contribute to clean water and reduce pollution. Chemicals: detergents, automotive fluids and fertilizers. Dispose of these according to container & local laws. Use earth-friendly products. Organic waste: leaves, lawn and garden clippings and animal excrement. Bag it as special trash or compost leaves, lawn and garden clippings. Properly dispose of household products that contain chemicals, such as insecticides, pesticides, paint, solvents and used motor oil and other auto fluids. Don’t pour them onto the ground or into storm drains. Dirty water from car washing on streets, in parking garages and driveways, ends up in our storm drains. The best way to minimize the effect of washing your car on a street, in a garage, or driveway is to use a commercial car wash. Most commercial car washes use 60 percent less water for the entire process than a homeowner uses just to rinse a car. And commercial car washes are regulated according to EPA standards. Always use biodegradable, phosphate-free, water-based cleaners. Wash on areas such as gravel or grass that absorb the water and earth-friendly cleaners; avoid car washing on concrete or asphalt pavement unless it drains into a vegetated area. Minimize water usage by using a spray gun with flow restriction. Empty wash buckets into sinks or toilets where water ends up getting treated, do not empty into storm drains. Pet waste contains bacteria and parasites that transmit diseases. When pet waste is left on lawns, in parks and not disposed of properly, it ends up untreated in stormwater and draining into our ocean, canals and bay. So, do not put pet waste in storm drains or leave it on surface areas. Bag it and put it in the garbage. Pick up pet waste from your yard. It is not fertilizer. Flush it or bag it tightly before putting in the trash. While walking your dog carry disposable bags to pick up and dispose of waste properly. Lawn chemicals are the fertilizers, herbicides and insecticides used in lawn and garden care. Depending on the toxicity level of lawn chemicals and their environmental impact, they can cause health risks and harm or kill insects and fish disrupting the entire food chain. Read labels on lawn chemicals carefully and always apply products sparingly. Use organic lawn chemical alternatives. Compost grass cuttings and leaves to create an organic, slow-release fertilizer and soil-enhancing material. Landscape with native plants, grasses and flower species to reduce the need for lawn chemicals. Keep leaves, grass clippings, trash and fertilizers away from storm drains. Sweep leaves and grass clippings on driveways, sidewalks or streets back onto lawns. Hosing driveways washes pollutants into storm drains. Commercial and industrial businesses contribute to stormwater pollution through improper practices that allow sediment, oil, grease, heavy metals, hydrocarbons, solvents, litter and other pollutants to enter storm drains. These discharges pollute our oceans, canals, rivers and lakes and are prohibited by law. Regularly dry sweep paved areas including parking lots, outdoor areas and dumpster areas. DO NOT use a hose. Collect and dispose of debris in waste containers. If you must use water for cleaning, use earth-friendly soap, a mop and a bucket. Dispose of wash water into the sanitary sewer. Major cleaning of exterior surfaces must include capturing all wash water and disposing of it into the sanitary sewer in compliance with local regulations. Do not put wash water into the street or storm drain. Never pour wash water outside or into a street or storm drain. Properly dispose of it into sanitary sewer (sink or toilet). Regulatory inspect and maintain storm drain inlets. Keep garbage/dumpster areas free from litter, debris and sediments. Keep dumpsters and waste bins covered. Check dumpsters regularly for leaks. Train all employees on good housekeeping practices and pollution prevention. Provide proper spill containment including secondary containment tanks or berms, where required. Keep material storage areas free from ponding rainwater or exposure. Label all materials and keep updated inventories of material stored on site. Provide and implement spill cleanup procedures and supplies for employees. Avoid over-watering and runoff by checking sprinkler overspray and/or broken sprinkler heads. Use irrigation timers. Collect all landscape debris and recycle or dispose of properly. Encourage landscaping employees and contractor to reduce/eliminate use of pesticides and fertilizers. Perform all vehicle and equipment maintenance indoors or under covered areas. Keep drip pans under leaking vehicles at all times. Repair all leaks. Ensure floor drains are plumbed to the sanitary sewer or cover drains. Keep absorbent materials/pads/rags readily accessible in work areas and use for spills. Segregate and label waste fluids and store in approved containers. Recycle oil, antifreeze and batteries according to local laws. Take vehicles/equipment to a commercial car wash, when possible. These facilities recycle water and/or drain wash water to the sanitary sewer. Wash vehicles/equipment over a pervious surface such as dirt, gravel or grass that allows water to evaporate or percolate. Do not allow the wash water to runoff into the street and storm drains. Protect storm drains or curb inlets. Collect all wash water by vacuum. Recycle or dispose of wash water via the sanitary sewer system. Load/unload equipment only in designated areas. Regularly dry sweep loading and unloading areas. If possible, cover loading areas. Divert all stormwater away from loading/unloading areas. Check shipments and trucks for leaks and spills. Clean up spills/leaks immediately and dispose of properly. If you must use water for cleaning, use a mop & bucket and dispose of wash water into the sanitary sewer. Major cleaning of exterior surfaces must include capturing all wash water and disposing it into the sanitary sewer in compliance with local regulations. Do not allow the wash water to runoff into the street and storm drains.